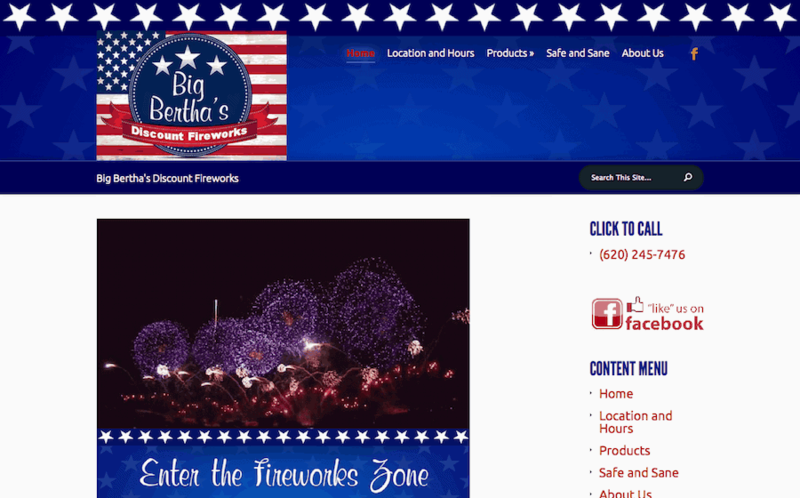 Big Bertha’s Discount Fireworks is family owned and operated, providing quality fireworks at deep discount prices. Before the owners contacted me to help with their website, they had been working with two different website developers, both of whom had been negligent and had created some serious problems, including a hacked site and lost data. I was determined to help these people with a website that would be secure and dependable, as well as attractive and interactive. We wanted to create a site with a patriotic style to coordinate with the Fourth of July focus of the fireworks business. With featured products in sliders and categories of fireworks clearly presented, this website is just what they wanted. The phone and tablet views work great for people who are out shopping for the perfect fireworks, with a clickable phone number for easy access. This website packs a lot of BANG for the bucks!